Neil and I became a team after the Rutles .. I was working with him on the beginnings of the Innes book of Records .. I was also working with Tony Ashton Peter Skellern and various other acts Paul Martinez was working with Ashton and Charlie Morgan was doing loads of sessions quite a few with me .. The polydor people came and saw Neil and myself at Chappell studios asked us to produce Otway .. The album 'where did I go right' three months later we started .. At Chappell .. Great fun had by all .. !! What a band we had ! These tracks were originally released on Scraps - Otway's superbly packaged TRIPLE album of previously unreleased tracks, demos & rarities. Sadly no longer available. Ollie contributes guitar, bass, drums and violin to his own production which is little short of a masterpiece. The 1979 Ollie & Otway section has become known as WAY & HAL since five of the songs surfaced three years later on OtWAY & BARrett's WAY & BAR album. 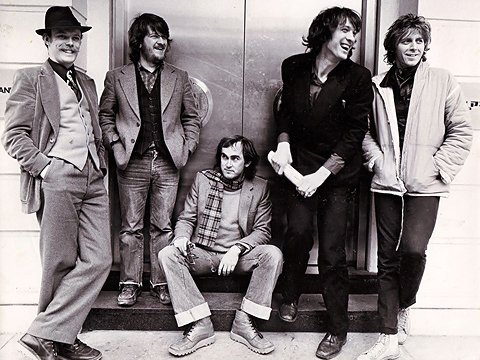 Their version of Natasha didn't appear until the 2014 complilation The Rest of Otway and Barrett. Charlie Morgan, who was at this time in Kate Bush's band. Subsequently he became one of the best session drummers in the country, played on numerous hits, and appeared at Live Aid. Bass: Paul Martinez, another session player, who later joined Robert Plant's band. [Both introduce by Steve James] Keyboards: Morgan Fisher, originally with Love Affair and then Mott The Hoople. He had his own band, Morgan, and after Otway he joined Queen. Guitar: Ollie Halsall, Kevin Ayers' guitarist as well as a session player. The premier American rock magazine, Rolling Stone, had his name amongst the ten top guitarists in the world. 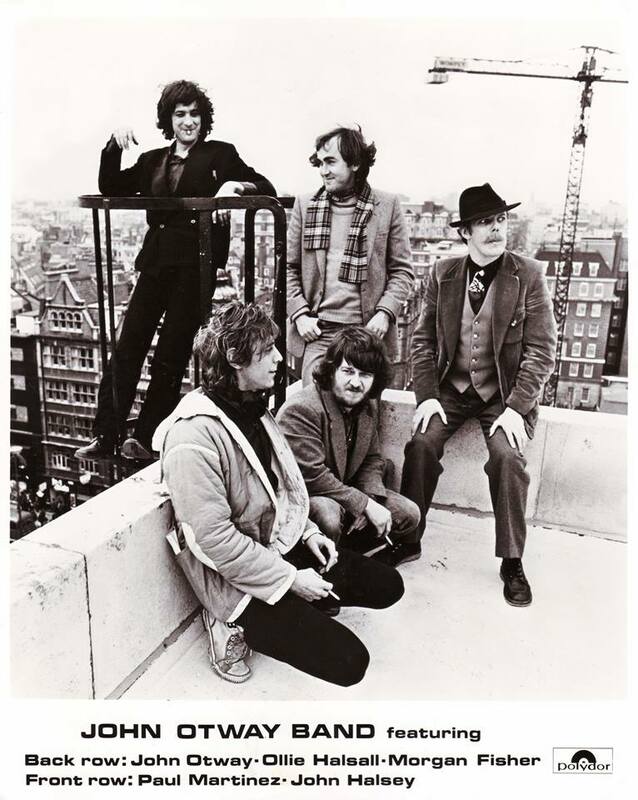 As Otway went into the Chappell studios to record the next album, both Polydor and Maurice could be forgiven for thinking that Otway was once more back on track. 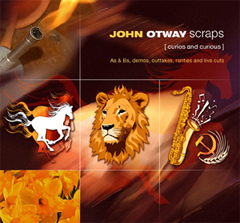 Neil Innes did a good job with John, and even the title of the resulting LP, Where Did I Go Right, suggests the faith everyone had in this new polished-sounding Otway. The whole band apart from the drummer [John Halsey, presumably on Ollie's recommendation, replaced Charlie Morgan] agreed to go out on the road with John and promote the new record. It was a good tour and it even made money. John did not like travelling in the mini-bus, but he did appreciate the fact that he could pay the rent after the tour was over. The band was the tightest and most professional ever. The first show was at the Venue in Victoria, London. This old converted cinema had a very high arch above the stage. Remembering his wish to be lowered onto the stage by helicopter while the band played the opening chords of 'the hit' [Cor Baby, That's Really Free], John found a long rope and decided to lower himself the fifty or so feet to the stage as a form of grand entrance. 'Great idea,' said Paul Martinez, the bass player. 'And Ollie and I can jump down from this scaffolding at the same time.' It sounded like a great idea and so they rehearsed it. Otway was fine. He came tearing down the rope, and only removed the top layer of skin from his hands in the process. Ollie took one look at the jump from the scaffolding, and decided to leave the acrobatics to John and Paul. Paul leapt perfectly on time and hit the ground at the same time as Otway, perfectly on cue for the first lines of the song. Unfortunately he also broke his leg. 'That looks great,' said Maurice to Paul, who was writhing on the floor. 'I think we can go with that.' They couldn't go with that. Paul did the concert, and most of the subsequent shows, seated, his leg in a plaster raised on a chair. However good this show was, and it was good, it did more for as a loony stage performer than it did as a recording artist. The new LP did not even venture near the album charts and by the end of the tour Otway was ready for his next major career move. 'Now can we go to the States?' he asked. Otway now looked on America as the way destiny had in mind for him to achieve international stardom, and Britain was merely the place where he had served his apprenticeship. Maurice was sent on a reconnaissance mission to New York, to prepare the continent for the forthcoming invasion. On his short mission, Maurice had done well and came back with the exciting news that a short but extensive tour of America had been pen­cilled in. This tour would cover both the East and West coasts, a couple of dates in the Mid-West and two dates in Canada. For obvious monetary reasons, Otway was back working as a duo again, this time with Ollie Halsall on guitar. John and Ollie did a few shows to warm up, including a couple at John's old haunt, the Oranges and Lemons in Oxford. They also did an extraordinary thing, they got together and wrote some songs. It was for a while a very productive part­nership, and in the short period of time between the last tour and going to the States, John and Ollie wrote a lot of material, including 'Cry Cry Cry', '2I Days', 'Body Talk', 'When Love's in Bloom' and 'Day After Day'. The Otway entourage consisted of John, Kathy, Ollie and John Rummens, a friend of Kathy's from art school days. Otway liked him: he was diplomatic, charming and had the ability to talk his way out of awk­ward situations. He had lived in Texas for a number of years while on a postgraduate course, and had some idea of what Americans were like. He was just the sort of person Otway needed to smooth the way through the ultra-low budget tour planned for him. He was hired as tour manager. Maurice flew out a few days early to organise what press and promo­tion he could and was due to meet them in New York. Cheap Atlantic flights in those Laker days were strange affairs, as a price-cutting war was going on between the companies. Maurice had worked out the cheapest possible way to take advantage of this and had given Rummens the job of putting this into effect. It was very un-starlike. 'There seemed to be a lot of: "How many tickets did you need? Four? What a shame we just have three for this last flight",' John remembers. Rummens learned the trick that free LPs and tee-shirts could smooth the way through a lot of travel problems. Even with this smoothing, it still took four days of getting up at 4 a.m. and being disappointed after eight hours of queueing before the star took off from Heathrow and headed for Washington DC. Rummens eventually hired a station wagon which could carry them­selves and the equipment, as long as John and Ollie sat with their guitars on their knees. The four rather cramped travellers set off on the long jour­ney to Manhattan. In fact the conditions were so cramped, and they were all so tired, that they ended up splitting the ride and spent the first night in Philadelphia, before meeting up with Maurice the following day. It is true that a lot of Americans love England. They like its culture, its history, its music and its eccentrics. John was amazed at how easily he was accepted by the citizens of New York. On their first night in that city, they all went down to a club called Hurrahs which they would be playing in a few days' time. The first American venue to host an Otway show was the Paradise Club in Boston. John and Ollie were supporting Iggy Pop. It was quite a good bill as both acts were pretty wild, and the turnout was good. It was also a strong start to the tour, and the duo went down well enough to get an encore. 'Now we've got Boston under our belts, let's get New York,' Otway said on the long drive back. They were headlining at Hurrahs, the advance publicity had been organised well, and Otway was nervous enough to put on a pretty wild show. After the second encore that night, Otway was convinced that if he could 'make it there he could make it anywhere'. Already, after the first few days of that tour, two major cities had fallen to the small invasion force. The invasion force was to get smaller too. On the way to Philadelphia Maurice mentioned, in passing, that money could be saved on hotel rooms if John and Kathy shared a twin room with Ollie. That was enough for Kathy who was, at this point, crammed in the back with John, Maurice and the guitars. She took the Greyhound bus down to Texas, and spent the duration of the tour with some of Rummens' friends in EI Paso. After a few more days on the East Coast, it was up north across the border and into Canada to play Toronto. The Edge Club there was one of those places ideally suited to the sort of show John and Ollie were doing -both in size and atmosphere. Oddly enough, more people here had heard of Otway than anywhere else. There was even a group of emigres from Aylesbury who turned up to cheer him on. Toronto was to witness John's greatest successes in North America. They played several nights and the audience grew with each subsequent performance. The longer distances could be flown as cheaply as driven by the trio left on the tour. Having played Detroit and Chicago, they flew the long jour­ney to Vancouver. The dates on the west coast were supporting the American band Pere Ubu. 'We really did well in Vancouver,' Otway remembers. 'The show started brilliantly because I tripped and fell flat on my face as I walked on stage. The audience liked that, and from that point on, I couldn't seem to do any wrong. It is widely believed that people on the west coast of America are more 'laid back' than those on the east. If this is true, then it seems that laid­back Americans do not like crazy, ungainly loonies. Ollie, whose playing was universally liked, impressed them, but John's mad antics did not go down so well. For example, while Ollie was playing a long solo, his head and body bopping around as he entertained these people with his brilliant playing, John would sneak up behind him and pull his guitar lead from his amplifier. People who admired Otway's very odd sense of humour, found it hilar­ious to see Ollie, mid-bop and mid-riff suddenly silent, with John stand­ing behind him grinning and holding up a jack-plug. People like Ollie, who admired good playing, and laid-back Americans found it horrible. John and Ollie played a couple more shows in New York on the way home. It was a good way to end that first trip. They had indeed built a small reputation. Ian Copeland came and saw one of the shows and was impressed enough to sign Otway to his agency. By the time Otway got on that plane home he was happy and confident. There were now two places in that huge Continent where Otway could genuinely claim that he had the embryo of a cult following. Back in England John was bored. He had enjoyed the electricity of America. Over here Polydor had not missed him and, however often they were told just how many records they could sell in the States, they were adamant about not putting out John's records over there. John spent a considerable time in the studio with Ollie following his return to England, in an attempt to record some of the songs they had written and worked out together. The tour they had just completed had taken its toll on the relationship though: the recordings amounted to nothing and the two of them went their separate ways. If you can see this, your browser doesn't support iframes. However, you can see the content here instead. If you can see this, your browser doesn't support iframes. However, you can see the content here instead.